I originally made this dough for my Food'N'Flix offering this month; I had planned to make a version of Mallomars, but they ended up being Mess-omars. Still, the cookie part was good. So, I stuck the dough in the fridge for another time. This was it! I guess Jake was bolstered by his fulfilled request for Mango Sticky Rice. So, when I asked what I should do with the chestnut paste I found, he ventured another suggestion: cheesecake?!? Okay. I decided to bake up my graham cracker dough for the crust. Whisk together the flour, baking soda, and salt in a small bowl. 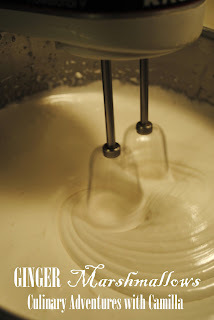 In a large mixing bowl, beat the butter on medium-high speed until creamy, about 2 minutes. Add the sugar and honey and continue to beat until creamy, about 3 minutes more. Beat in the vanilla. 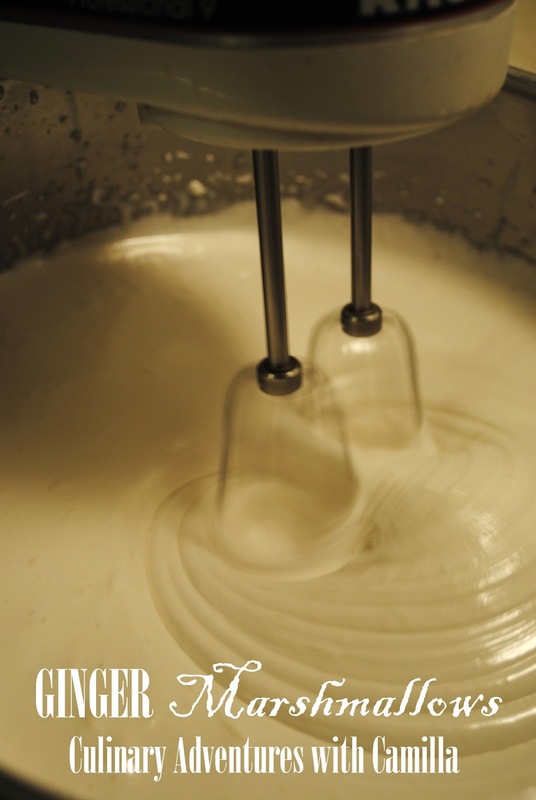 Add the flour mixture in 2 additions, alternating with the milk and beginning and ending with the flour mixture. Beat until just combined. Lightly flour the work surface. 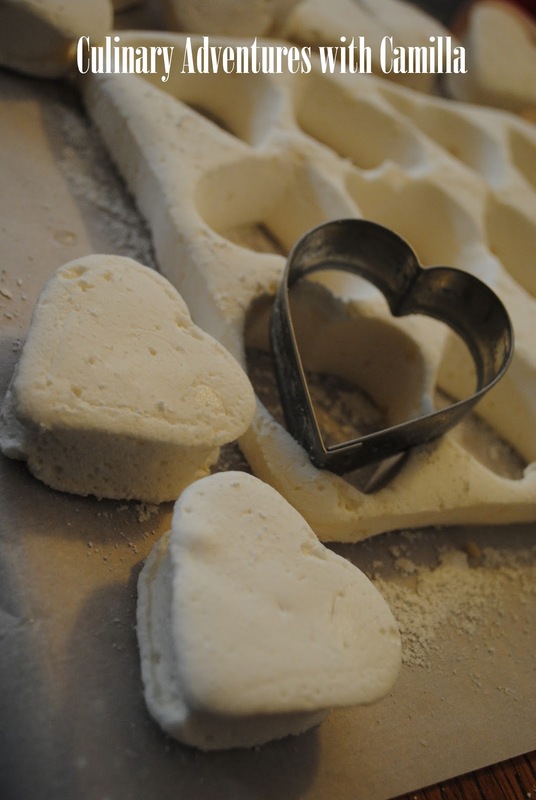 Roll the dough to a 1/4-inch thickness - between two pieces of parchment. Since they were just going to end up as crushed crumbles anyway, I didn't bother to cut them into any particular shape. I just left them as a blob shape. Preheat the oven to 350°F (175°C). Bake for 15-18 minutes or until the crackers are dry to the touch but still have a tiny bit of spring to them. Do not bake until crisp. The crackers’ color will barely change. Cool completely on the pans set on racks. It is a rare day that Jake makes a request for food; he usually just eats whatever I make. 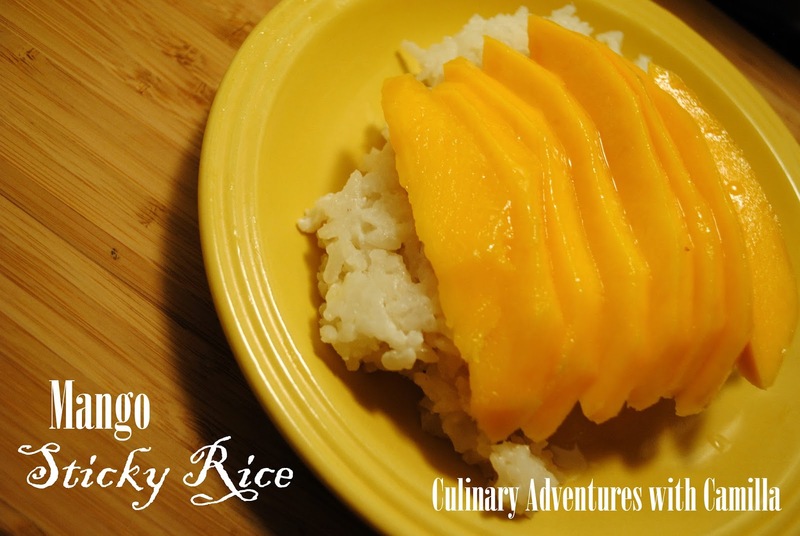 But when he looked at the mango in our fruit bowl and asked, "Do you have any rice? The white, sticky kind?" I followed his gaze and commented, "You want mango sticky rice, don't you?!" Yes! Okay. This is not a traditional Thai Khao Neeo Mamuang; it's my own fast and loose interpretation. But it is delicious! Place all of the ingredients - except for the mango - in a large saucepan that has a lid. Bring to a boil, reduce the heat, cover, and let steam until the rice is tender. If the rice is not cooked, but all the liquid has evaporated, add in more milk. Once the rice is cooked, spoon it out on individual plates and top with mango. 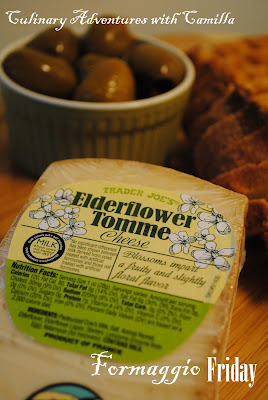 Though I have been completely remiss in trying a new cheese every Friday as I had planned for this year - Formaggio Friday - yesterday I found one at Trader Joe's that caught my eye: Elderflower Tomme. So, I bought it and served it with stuffed olives, rustic baguette, and an unfiltered wheat beer with a slice of lemon. Tommes, the story goes, are made by alpine cow herders during the winter, when milk is scarce and the nutrient concentrations in the milk markedly different. These are the same herders who make Comté and Beaufort—rugged, elastic cheeses that are crafted in huge wheels durable enough to sustain long transport down the mountain. Tommes were meant for the family versus something sold at market. As such the wheels are smaller than their summertime counterparts, they are aged for fewer months, and their interior is more creamy and fragile. Tommes tend to be grassy in flavor with an unctuous texture. I can't say that we could really discern the elderflower specifically. But it was slightly more fruity than other tommes we've tried. And it was delicious! The beginning of September means one thing for my family: apple picking! 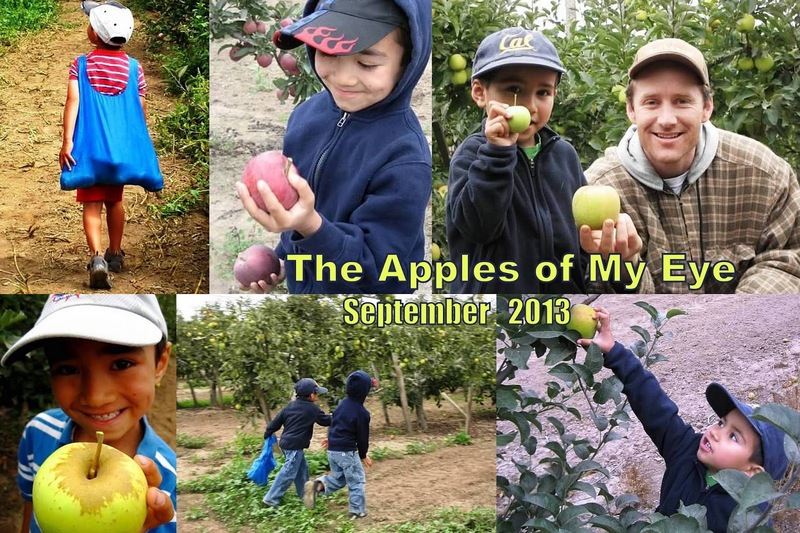 It's a family tradition...though we don't always go to the same orchard every year. Each year I stare at the bounty - juicy delicious orbs in all shades of red and green - and try to decide what to make. Apple Butter is a must. The boys love Apple Hand Pies. I've made an Apple Tart with Plum Glaze, Spiced Apple Chutney, and even stuffed a pork tenderloin with apples when we made Fyldt Svinem Rbrad. But I've decided to open it up for suggestions, this year, and ask all of my foodie blogger friends for some suggestions. I'll keep the link open till September 6th and post a round-up that weekend. Feel free to link up to five recipes. We all see these labels every time we go to the store, but do we really know what they all mean?! I decided to delve into this a little bit more. Here's what I found: In 2002, the USDA's National Organic Program standardized label lingo so that consumers would know that when one product claimed 'organic' it meant the same thing as another product labeled 'organic.' I found this graphic at GlutenFreeResourceDirectory.com, but will include the details below - just in case you can't read it clearly. This is important! 100% Organic: All ingredients must be certified organic and processing aids must be organic as well. The name of the certifying agent must be on the label which may carry the USDA Organic seal. Organic: Products must contain at least 95% certified organic ingredients. The remaining 5% (except salt and water), along with any non-organic processing aids (such as chlorine to wash packaging equipment), must be from a national list of substances the USDA has approved for use in organics. The product may carry the USDA Organic seal. Made with Organic: Packaging cannot include the USDA seal, but at least 70% of the product must be certified organic; nonagricultural ingredients must come from the national list. 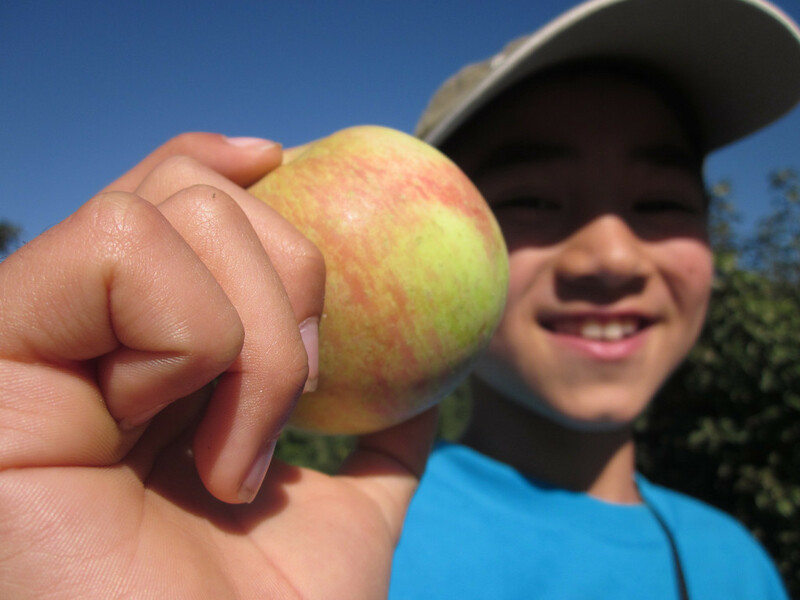 The quality of organic foods is high, even at 70%. Organic Ingredients: Below 70% organic, the product cannot claim on its packaging that it's organic, except to list specific certified organic ingredients on the information panel. Fair Trade: Non-government organizations certify that growers receive minimum prices and community support from buyers and followed specific environmental practices. Standards aren't as strict as for 'organic' designations. Free-Range: Birds such as chickens are sheltered and have continuous access to the outdoors, along with unlimited access to food and water. However, these claims are not certified. Cage-Free: Birds can freely roam inside a building or room with unlimited access to food and fresh water. They're without cages, but can still be packed very tightly even when organic. Grass-Fed: Animals receive most of their nutrition from grass throughout their lives but may also eat hay or grain indoors during winter. Animals may still receive antibiotics and hormones, according to the USDA. No Added Hormones: Already true of organic, so it's conventional producers who tend to use this term, but there's no certification for these claims. What do you think? Did you already know these distinctions and nuances of some fairly common label-terms? It's never bad to get a refresher. Place all of the ingredients - except the juice from the lime and the ginger syrup - in a large flat-bottom pan. Bring it to a boil. 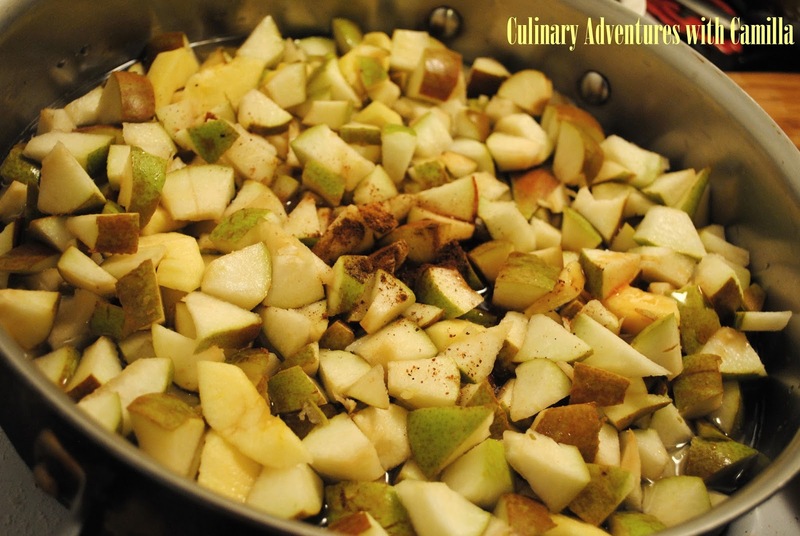 Reduce heat and simmer until the pears are tender, approximately 15 minutes. Mash the fruit with a potato masher as the pears soften. 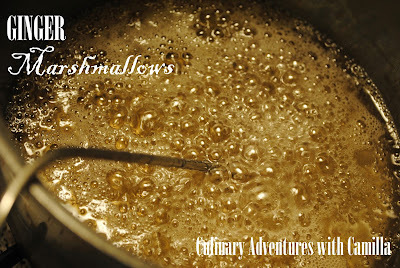 Keep simmering until the liquid has thickened to the point where a path remains if you drag a spoon through the center. Remove the cardamom pod and the star anise. 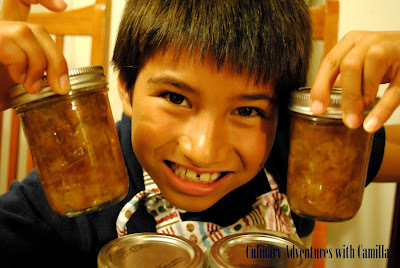 Place the jam in sterilized jars, leaving about a 1/2" gap to the top. 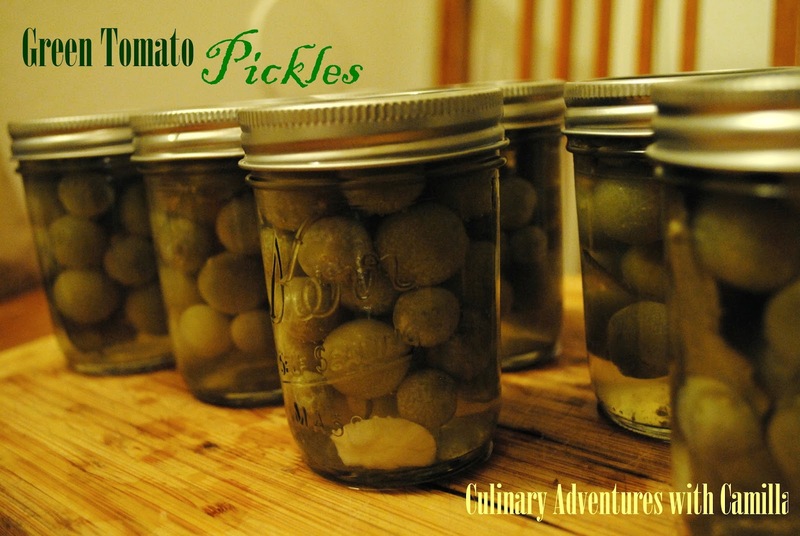 Gently tap the bottom of each jar on the counter to release any air bubbles. Using a damp clean towel, wipe the rims of the jars and secure the lids and rings. Process in a water bath for 10-15 minutes. 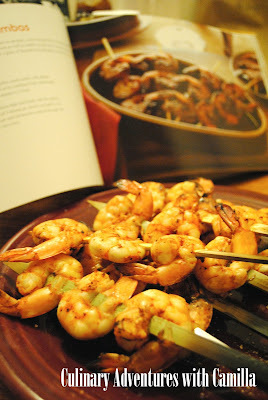 Remove the containers with tongs and let cool on the counter overnight. When I saw this recipe, I knew that I wanted to make it. Then a friend gave me 2 cups of homemade duck stock and it was a done deal. This is, of course, my adaptation; the original uses fish stock instead of duck, lemon juice instead of lime, asparagus instead of peas, and parsley instead of carrot top greens. As always, I use what I have! Cut the fish into pieces. Poach in duck stock for 8-10 minutes - until fish is opaque and firm to the touch. Transfer the fish to a deep serving platter and keep warm. Melt the butter and stir in the flour. Gradually whisk in the stock. Simmer until thickened. Beat the egg yolk and whisk into the sauce. Season with salt and lime juice. 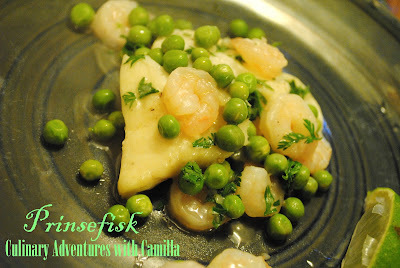 Garnish with shrimp and peas. Sprinkle with carrot top greens. Serve with slices of lime. 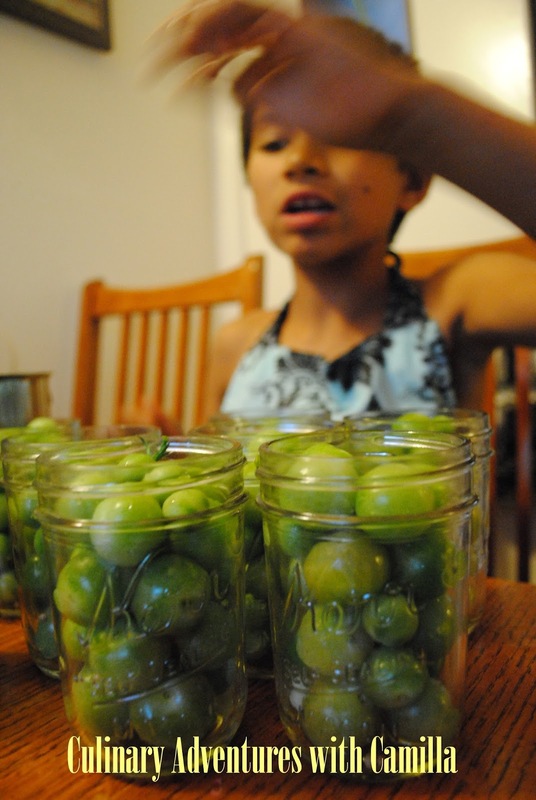 Yesterday I picked up my kids - from my parents' house - and Enthusiastic Kitchen Elf had a box full of green cherry tomatoes and pockets full of pears. Mom, he gushed, I want to make pickled tomatoes and pear jam tonight! Well, we were busy last night, so I stalled him. But his enthusiasm hasn't waned, so tonight is the night. 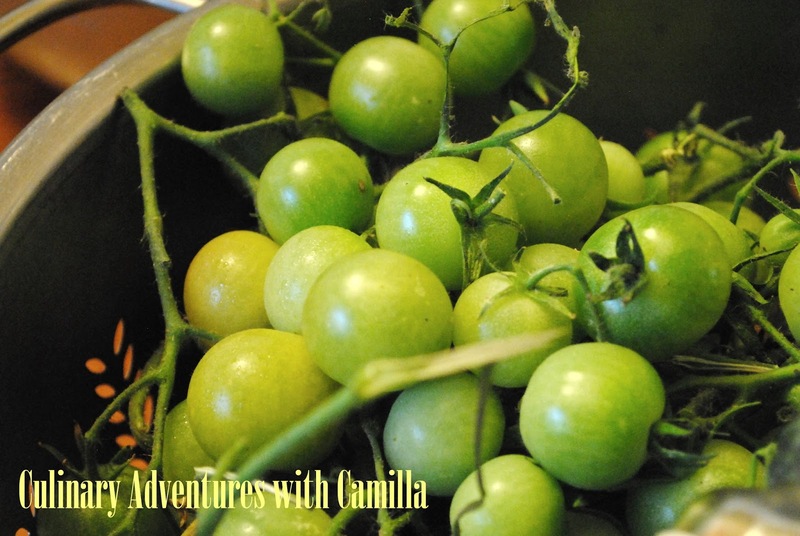 First up: pickled green tomatoes from my parents' friend's garden. 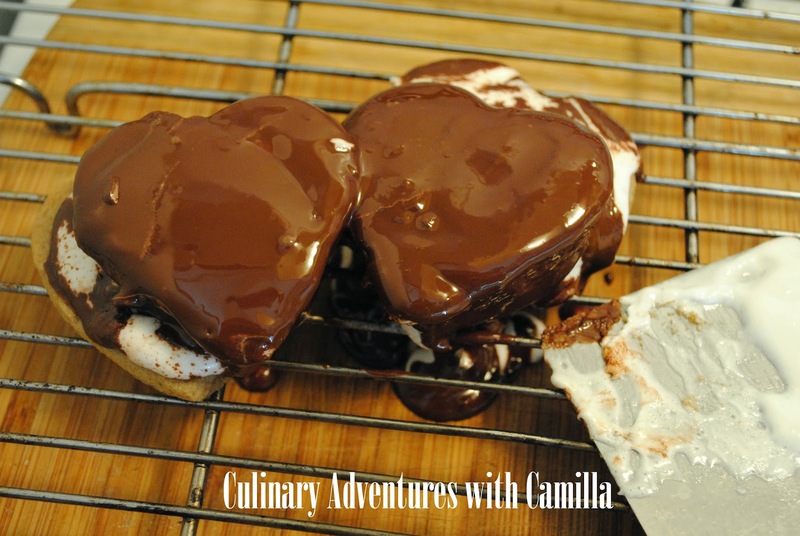 I found several different version of this recipe and melded a few together for my own batch. 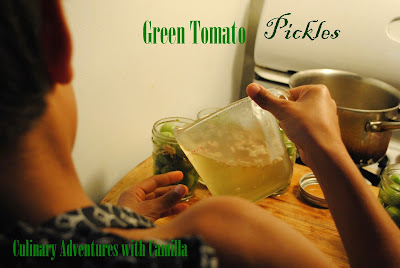 I accidentally forgot to add in a few tablespoons of sugar, but I found several pickle recipes without sugar. So, I didn't fret too much. 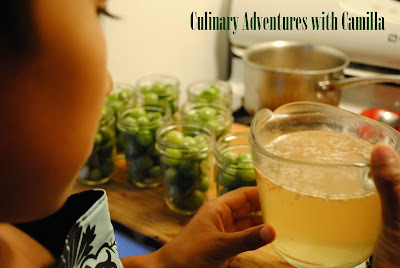 Bring water, vinegar, and salt to boil in a non-reactive saucepan. Boil for 5 minutes. In the meantime, poke a hole with a toothpick or skewer in each of the cherry tomatoes so that the brine can penetrate the thick skin. 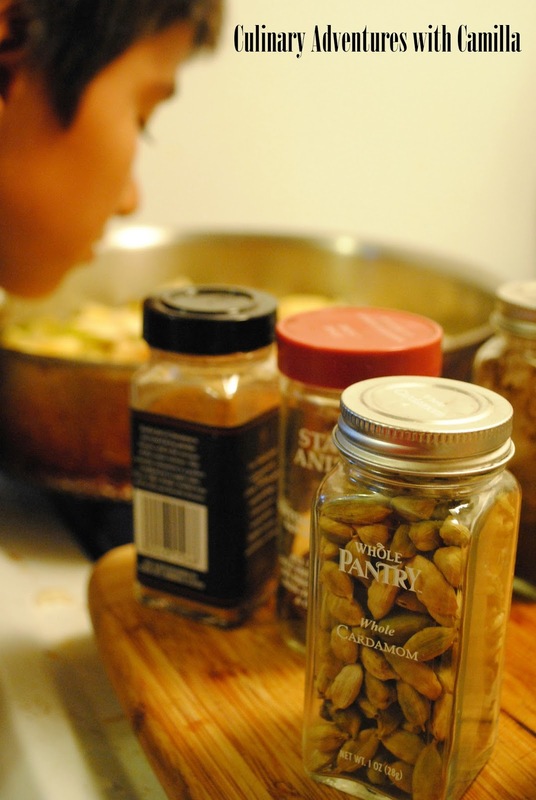 In the sterilized jars, place half a garlic clove, 1 bay leaf, and a pinch of coriander seeds. Pack in the tomatoes tightly to within 1/2" of the top. Pour boiling brine over the tops of the tomatoes. Wipe rims, position lid over the top and screw rings on just until they hold tightly. Place jars in a large pot and fill with water to cover jars. Cover the pot and place pan over high heat. Allow water to come to a rolling boil, leave lid on, and boil hard for 15 minutes. 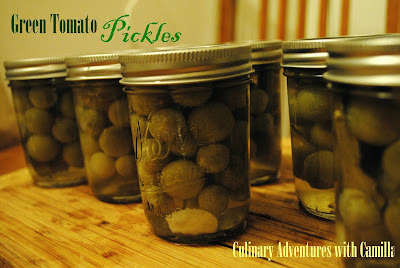 When the 15 minutes are up, shut off heat, remove lid and allow the jars to sit in the hot water for another 5 minutes. Remove jars to a cooling rack and allow to cool, undisturbed. I heard mine seal within 5 minutes of being removed from the pot. But I left them alone overnight. 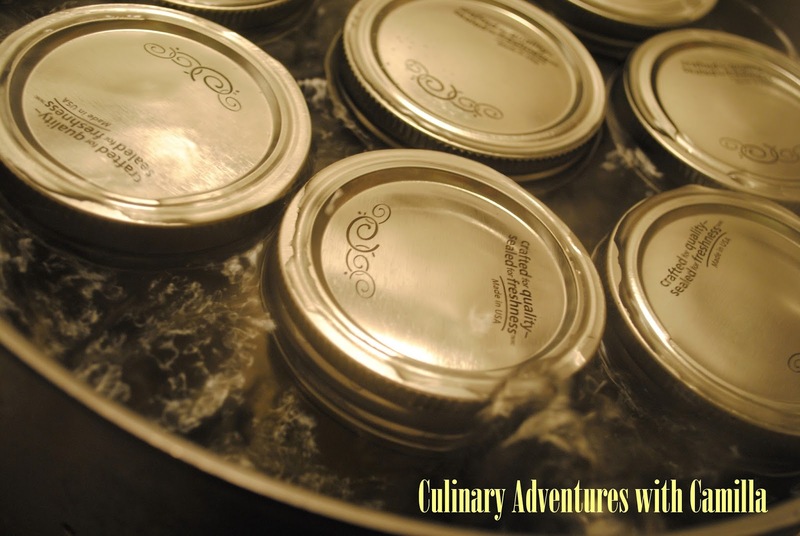 When jars and their contents are completely cooled, wipe down with a clean, damp cloth, remove rings and store in a cool, dry place. 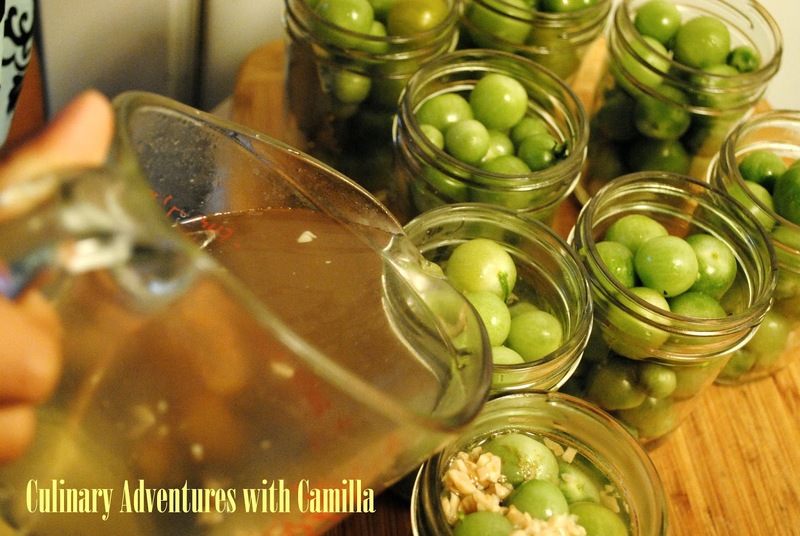 The pickled cherry tomatoes will be ready to eat in 4 weeks. Can't wait...stay tuned for the tasting at the end of September. 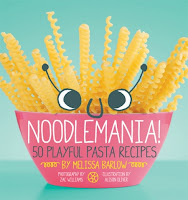 Several months ago, Quirk Books mailed me a review copy of Melissa Barlow's Noodlemania! 50 Playful Pasta Recipes. 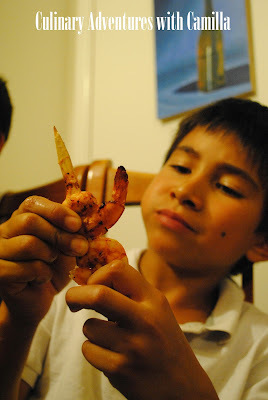 * I had agreed to review it because my boys were on a huge homemade pasta kick. They had rallied together for a pasta machine and are quite adept with it; they are the Pasta-Making Manns. They even had a "roll-off" with friends for a birthday party. It was Team Linguine v. Team Fettucine. But I put it in the wrong stack of books and completely forgot about it. Yikes. Sorry! 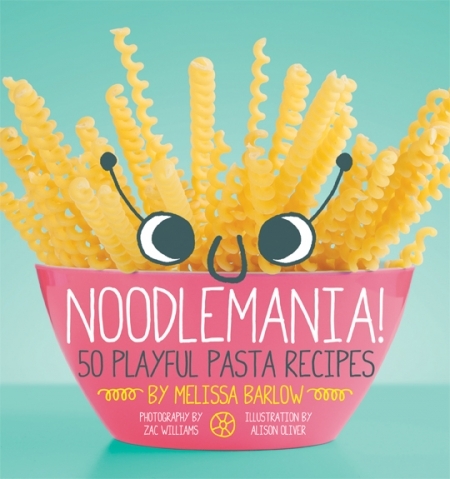 Melissa Barlow's Noodlemania! 50 Playful Pasta Recipes is heavy on the fun factor. Super duper fun. Like play with your food fun. 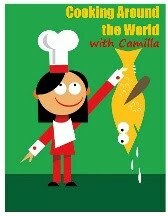 Vivid colors and cutesy drawings grace the pages of the cookbook. And the interspersed Fun Facts are a kick. Did you know that the average American eats 20 pounds of pasta in a year while the average Italian eats 60 pounds of pasta in a year?!? Or that noodles are one of the world's most popular foods, and scientists have found noodles dating back 4,000 years?! But I think that my boys - who are 9 and 11 years old - were a little outside of the target audience age. I think it would be perfect for a family with a pasta-loving toddler. Maybe early elementary school. Also, I am not a fan of food coloring. Period. So, while I loved the color contrast of her Seahorse Salad, I would probably try to find tomato pasta and spinach pasta instead of resorting to dying my cooking water. Same with the Purple Pasta Monster. We love creamy alfredo. It doesn't have to be purple, does it? In the end, I adapted one of her recipes and we did enjoy it! I used some wild boar meat that a friend gave me, made some fresh tomato sauce, added arugula because I add greens to everything - just ask my veggie-averse sister-in-law! - and it was delicious. But I did diverge from Barlow's original recipe. I will, at another time, give her Ravioli Cupcakes a try. Those sound intriguing. inspired by Melissa Barlow's Noodlemania! In a souppot, I boiled lasagna noodles and cooked according to the package directions. In a large saucepan, I cooked four spicy sausages. Once those were cooked, I cut them into cubes, deglazed the pan with a splash of red wine, and added 5 C of fresh arugula leaves to the wine to wilt the leaves. In a mixing bowl, I stirred together 1 C of lowfat cottage cheese, 1 C of fresh ricotta, 1 C cubed cheese, 1 T anise seeds, 1/2 C fresh tomato sauce, and 2 beaten eggs. Then I added the sausages and arugula. Season to taste with freshly ground pepper and sea salt. Preheat oven to 350. Spoon the mixture onto one end of a lasagna noodle and roll. Place roll in a baking dish. Once you've finished making the rolls, add heavy cream and red wine to the pan. Sprinkle with parmesan. Cover pan and bake till the sauce is bubbling, about an hour. There you have it. I didn't love the cookbook but it was adorable. And I know a few families with younger kiddos who would flip for this book. I mean, how can you not love chicken dinosaurs climbing a mountain of spaghetti? I can definitely see the appeal for the six and under crowd. *I received a complimentary copy of the book. "Unprocessed food is any food that could be made by a person with reasonable skill in a home kitchen with whole-food ingredients. It doesn’t mean you actually have to make it yourself, it just means that for it to be considered “unprocessed” that you could, in theory, do so." Since I could make my own pasta, pasta from the store can fit the bill?!? But even though I make my own jam, I don't make my own sugar...how does that fit into the rules? I'm guessing jam is out. Maybe anything with sugar is out. So, I'm going with a modified pledge. If I had all day to figure this out, I could probably do away with processed completely, but with full time work, full time parenting, and the dozens of other foodies balls I already have in the air, I'm saying this - with confidence: For the month of October 2013, I will serve my family one completely unprocessed meal every day...at least. That sounds achieveable. Click here to read more about the challenge. Wanna join me? It should be fun and educational - and perhaps eye-opening to see what I eat that's processed without me really thinking about it. While I made a modified pledge for October #Unprocessed 2012, reading these definitions made me feel a whole lot better about my possibility of success. And I've renewed my intentions for this year. What do you think? Can you do it? Would you?! Join us! Click here read it on Andrew's Eating Rules website. Or read below for his answers to the questions that I had. Would these have been deal-breakers for you? Salt. Depending on how refined it is, this may or may not be okay. Stick with the natural, unprocessed salts such as the fabulous Fleur de Sel. Nut Butters. Look at the ingredient list. If it’s just “Nuts & Salt” (or better yet, just Nuts), then it’s great. But if it’s got stabilizers, sweeteners, and oils, it’s a no-no. Breads. Again, it’s all about the ingredient list. The best option, of course, is to make it at home. But if it’s store-bought, read the ingredient list. The flour should be whole grain (avoid these pitfalls), and there shouldn’t be fillers, preservatives, artificial sweeteners (yes, they sometimes add those to 100% whole wheat breads. When I tore open the envelope from Quirk Books and revealed On a Stick! 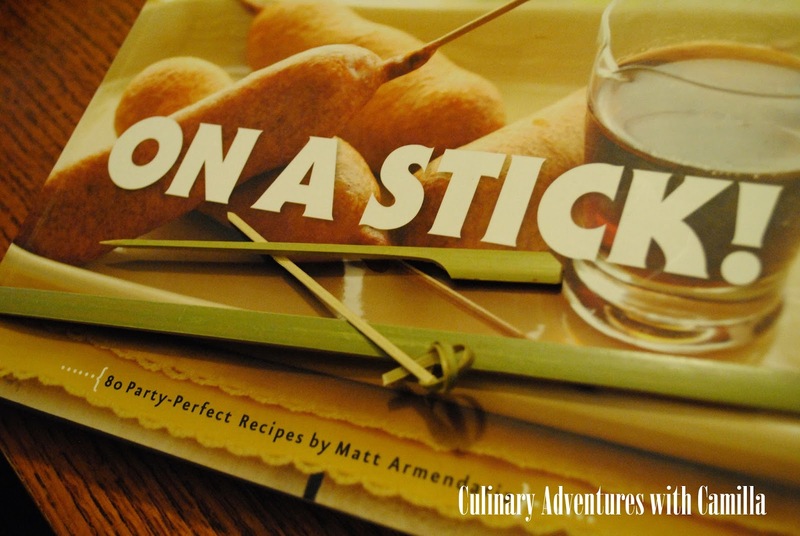 80 Party-Perfect Recipes by Matt Armendariz*, I had to fight all three of my boys to flip through it. Literally fight. By the time I got to thumb through the pages with post-it notes and a pen in hand, there were already some pages marked as favorites. 'Please!' was scrawled in someone's messy handwriting on a scrap of paper, holding the page. Probably Dylan. The only stumbling block: many of his recipes are deep-fried and I, as a general rule, don't eat fried food. So I knocked Breakfast Pancake Dogs with Maple Syrup, Chicken and Waffles, Corn Dogs, Deep-Fried Mac'n'Cheese, and Doughnut Holes off the list immediately. They just didn't appeal to me plus I don't have a way to deep fry anyway. 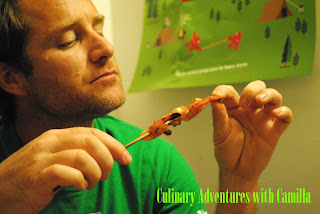 I really wanted to figure out how to adapt his Fried Mushrooms with Roasted Onion Dip, Molotes with Fresh Tomato Salsa, and Savory Tofu Dango into non-fried versions. I'll get around to that eventually. I hastily scribbled out a grocery list for Pinchos de Gambas, Grilled Sweet Potatoes, and Elote. I had everything I needed for some Antipasto Skewers. It sounded like the perfect Friday night dinner. It was. "Skewer it, stab it, stick it!!" Armendariz writes. 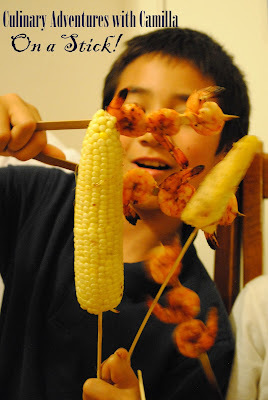 "Eating food on a stick is fun, festive, and just plain delicious." He's right, you know. Sticks are playful; everyone's inner toddler likes to play with their food. That's an 'R'...just in case you can't make that out! Preheat the oven to 375°. Combine all of the ingredients in a large bowl. With moist hands, shape meat mixture into tablespoon-sized meatballs. Arrange meatballs in a single layer on a jelly-roll pan coated with cooking spray. Bake meatballs at 375° for 35 minutes or until done. Roll them in a little bit of sauce return them to the oven for 5 minutes. Serve with additional sauce on the side. Not only were the recipes in this book super fun, they were tasty. 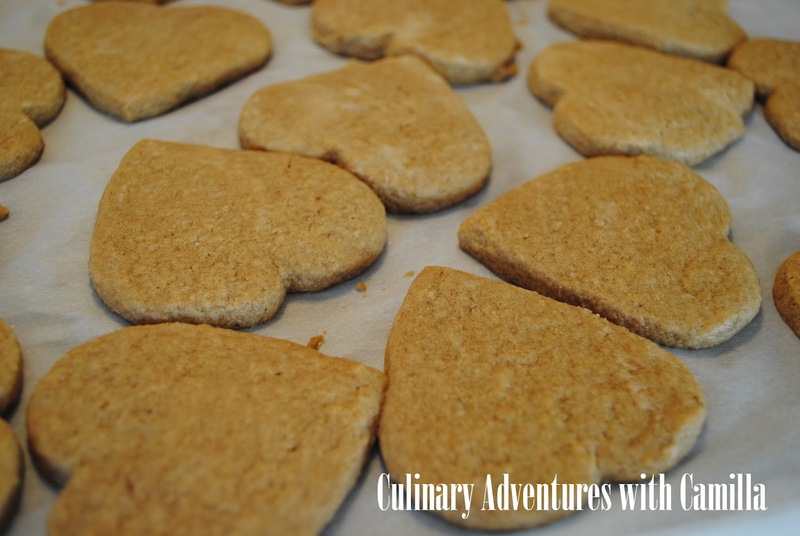 I tried half a dozen of the recipes and each one was easy to follow and delicious to boot. Winner, winner chicken dinner in my book! *I did receive a complimentary copy of the cookbook from the publishers. But all opinions are 100% my own. 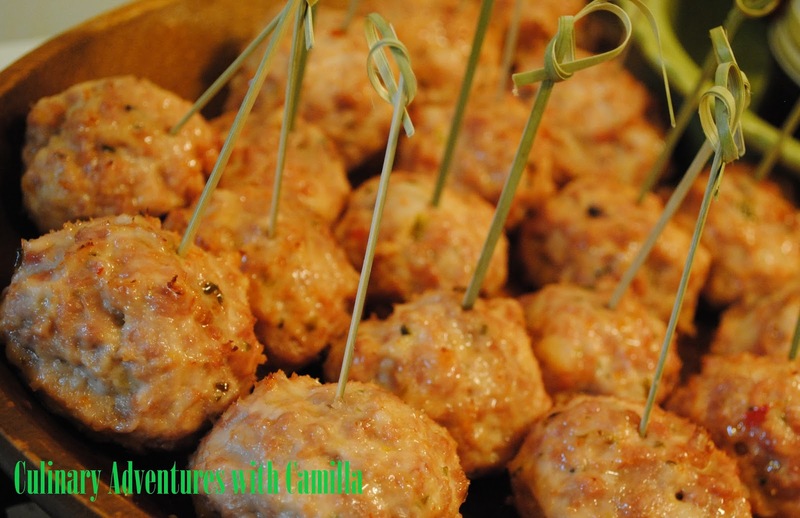 I originally made these for what turned out to be a disaster - Mess-omars for Food'N'Flix - then I realized that I could skewer them. Thanks for the inspiration, Matt Armendariz! I am right there with you: things on a stick just taste better. Besides, stabbing them helped me get out some aggression after my kitchen flop! Prepare a 9×13 inch pan by oiling it with or butter. Dust powdered sugar over the oiled sides of the pan. Place 1/2 C of water in a large mixing bowl. Sprinkle gelatin over water and allow to soften, 5 minutes. 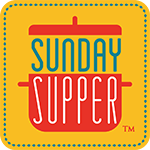 Place remaining water, sugar, syrups, and salt into a large saucepan. Melt all of the ingredients together, without stirring, and bring to a boil. Boil until the syrup reaches 240 F on a candy thermometer. Before I start this post, I want to say that I made a HUGE mess. It was a gigantic, sticky, tasty mess. I had good intentions and my components were all perfect. But, when I tried to put them all together...let's just say, 'ugly' would be a generous description. I originally titled this post 'Gingo-Mars' but after I made them, they became Mess-omars. Caroline from Caroline Makes is hosting Food'N'Flix this month. 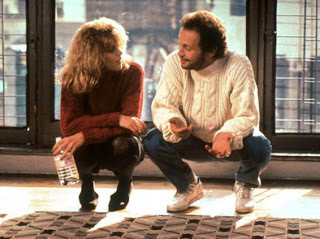 And her pick - When Harry Met Sally - is one I've probably seen fifty times. No exaggeration. Maybe more. When I was in high school, my best friend, Jenn, and I would make apple pies on Friday evenings and watch it ad nauseum; we were real party-girls, can't you tell?!? Click here to see Caroline's invitation to her movie selection. 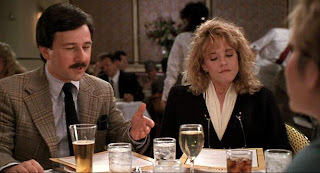 Apple Pie A La Mode: (Sally) I'll have the chef salad please, with the oil and vinegar on the side and the apple pie a la mode. But I don't want the ice cream on top, I want it on the side, and I'd like strawberry instead of vanilla if you have it, if not then no ice cream, just whipped cream, but only if it's real, if its out the can then nothing. Bloody Mary: (Sally) Do you have any Bloody Mary mix? 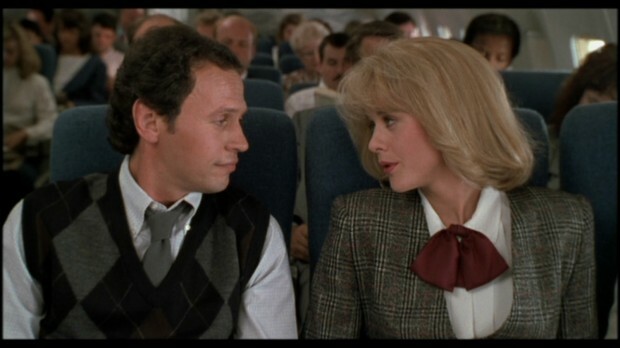 (Stewardess )Yes. (Sally) No, wait. Here's what I want. Regular tomato juice, filled about three quarters, and add a splash of Bloody Mary mix, just a splash, and...a little piece of lime, but on the side. Parikash and Pecan Pie: (Harry) For the rest of the afternoon, we are going to talk like dis. Waiter, there is too much pepper in my paprikash. ...But I would be proud to partake of your pecan pie. Ethiopian: (Harry) It started out fine, she's a very nice person, and we're sitting and we're talking at this Ethiopian restaurant that she wanted to go to. And I was making jokes, you know like, "Hey I didn't know that they had food in Ethiopia? This will be a quick meal. I'll order two empty plates and we can leave." 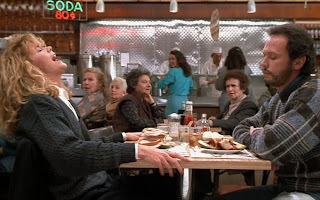 Deli Sandwiches: (Sandwich shop patron) I'll have what she's having. If you don't know what this refers to, rent the movie and watch it. Seriously. You won't regret it. Coconut Cake with Chocolate Sauce on the Side: (Harry) We had this enormous coconut cake. (Sally) Huge coconut cake with a - with a - tiers and there was this very rich chocolate sauce on the side. (Harry) Right, cause not everybody likes it on the cake, cause it makes it very soggy. 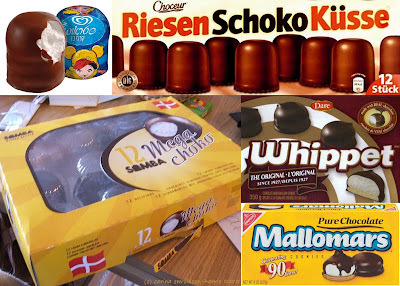 But, in the end, Jake voted for a version of Mallomars - "You got Mallomars, the greatest cookie of all time." Besides the movie, I have never heard of a mallomar...much less seen one. But, apparently, these cookies are found around the world. They are called Whippets in Canada, Krembos in Israel, Flodebolle in Denmark, Tunnock’s Teacakes in the United Kingdom, Zefir in Russian-speaking countries, Schokokuss in Germany, and Mallowpuffs in New Zealand. So, I took the challenge, but had to do some searching. I found this version of a Homemade Mallomar Bar from Serious Eats; but I settled on using this one from Leite's Culinaria as my starting point, infusing mine with ginger and other fun spices. And, as I said in the beginning, my creation was a bit of a disaster. But all of the parts, separately, were good. Lightly flour the work surface. Roll the dough to a 1/4-inch thickness - between two pieces of parchment - and cut out the crackers; I used a heart cookie cutter. 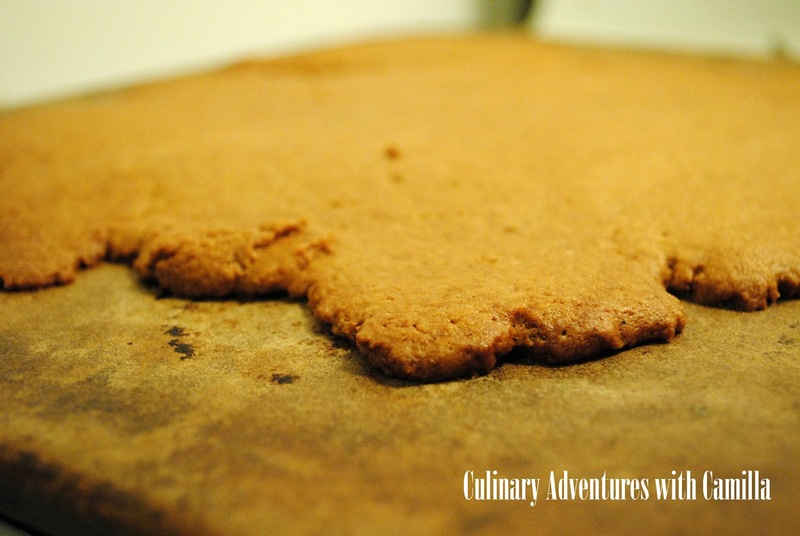 Transfer the parchment paper to a cookie sheet and place in the freezer until ready to bake. Preheat the oven to 350°F (175°C). 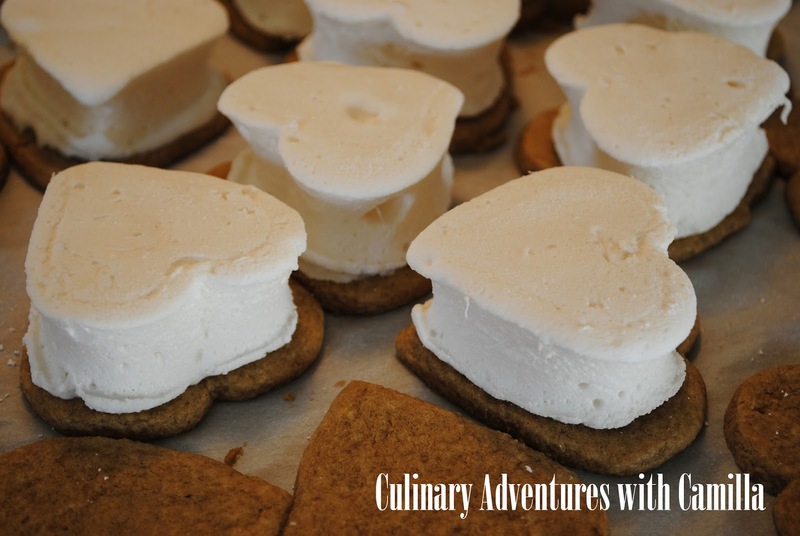 Transfer the pans of graham crackers from the freezer to the oven and bake for 14-18 minutes, or until the crackers are dry to the touch but still have a tiny bit of spring to them. Do not bake until crisp. The crackers’ color will barely change. 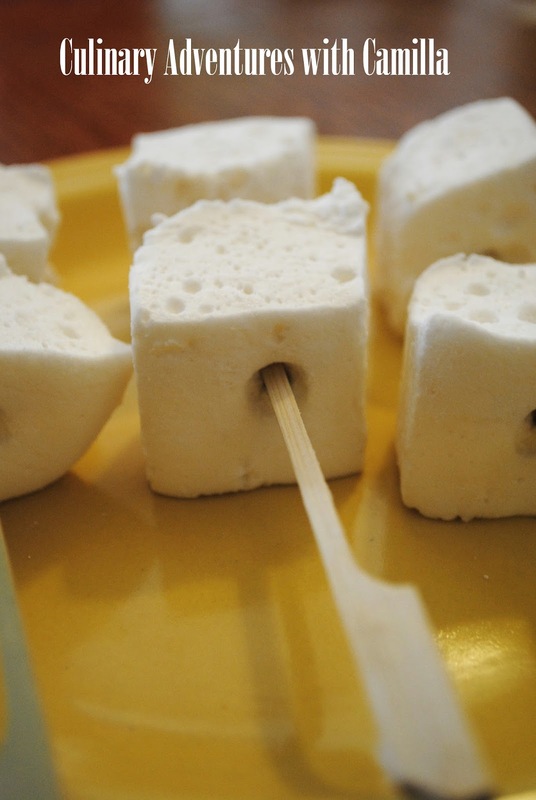 Place the pans on wire racks and immediately, while the crackers are still warm, place a marshmallow on top of each cracker. The heat of the cracker will cause the marshmallow to stick the cookie, which is essential for the following chocolate-dipping step. Cool completely on the pans set on racks. Chocolate Topping - Melt the chocolate in the top of a double boiler over simmering water. 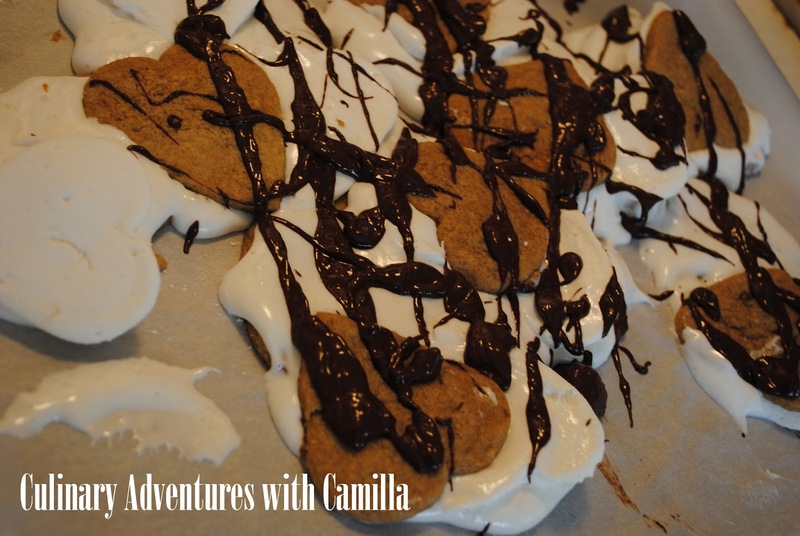 I used Ghirardelli (60%) chocolate chips. Then this...I didn't have a chance to cool them. They began to ooze immediately. So I topped them with another cracker and just drizzled the chocolate all over. The boys happily devoured my ugly mess. Next month, This Mama Cooks! is hosting. We'll be watching, or re-watching as the case may be, Toast. Hope you'll join the fun.